Is Gleni the perfect match for your Bag Personality? Read the following results to see whether you are our perfect customer! Though we have plenty of functional bags that would suit you, you are unlikely to buy from us. You are looking for convenience not style and you want a bag that can stand any amount of wear and tear. Top quality exotic skins that need a certain amount of looking after are just too much trouble for you. You could find something to suit you in our professional range of bags, made of sturdy calfskin, but you’re more likely to grab the first convenient, cheap bag you see in the sales when your current bag wears out. We have plenty of classic bags that will suit you, but we know that once you have bought your perfect bag from us, you won’t be back for a while, as it will last you for a very long time, never going out of style and you’ll love it so much that you won’t feel the need to buy another bag for ages. Once you discover the quality of our bags you will be a loyal, once a year client. You will probably subscribe to our newsletter and keep an eye on all our new collections, so that when the time comes for your new purchase you will know exactly which bag will be your chosen handbag for the next year. You are unlikely to be one of our clients, in fact you probably aren’t even reading this! Designer labels are your lifeblood and unless a big celebrity is seen wearing a Gleni bag, you won’t even know about our top quality bags. You are only interested in the big name logos, so are never going to notice the quality of any bag without a designer label. Unless a bag has Fendi, Prada, Gucci written all over it and is in the sale at a discount price you are never going to buy it. If you reached our site by accident you will have already gone off looking for a bargain somewhere else! You are a customer that we will get to know well. You’ll buy one of our bags and love the feel of the leather so much that you come back to get another one in a different color to match your latest outfit. Or maybe you’ll need a bag to match a new pair of shoes, so will order it especially in our Craftsman Laboratory. We’re sorry, but you won’t find anything for you here, until you grow out of this phase of your fashion career and take your image a bit more seriously! 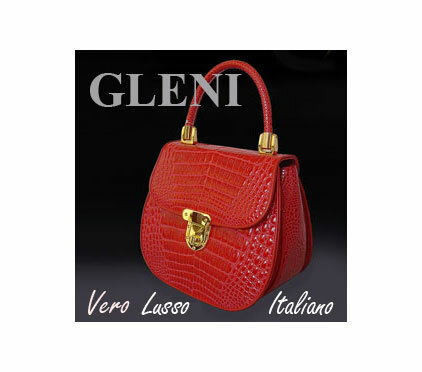 Gleni has plenty of youthful and fun bags but they are all designed with elegance and style in mind. Even though you hardly ever carry a bag, you might well become our customer. You might fall in love with the feel and softness of our leather and invest in the perfect little clutch that hardly weighs a thing, or a light shoulder bag that you can forget you’re even carrying. You may only use them occasionally and then go back to your carefree, hands-free habits! You have all the qualities of a star Gleni customer! Once you have worked out what you want you will often buy all the bags you need in one go, so taking advantage of our generous discount for those buying multiple items. You’ll take time choosing your bags, checking measurements and all the details before finalising your order. You’ll have fun browsing in our Boutique and will fall in love with the beauty of all our handbags, but there is sure to be one that will stand out from the rest and make you lose your heart to it. You won’t stop to consider whether the color will match your wardrobe but will impatiently rush through the checkout process eager to get your purchase delivered as soon as possible, so that you can glory in its gorgeousness! Even if you don’t recognise yourself in any of these light-hearted bag personalities, (and we’re sure that many of you don’t!) we hope you will come and visit our Boutique and find just the right bag for you. We’re looking forward to welcoming you to Gleni and hope that you too will become one of our devoted clients, just as soon as you see and feel the quality of our handbags for yourself.